We loved the in-store party with Ned Bustard and his family, celebrating the Church History ABCs book. Ned told us a bit about making some of the pages, and why he put little quirky things in. (Ahh, the button down Oxford shirt on John Owen, from Oxford. I hadn’t noticed that!) There are some fun photos at facebook; it was fun seeing kids and parents, eager to learn something about this clever, new ABC book. It dawned on me, as it does from time to time, how foreign this stuff must sound to many. Being excited about Tertuillian? Ignatius? Queens and artists and missionaries of years ago? Well, indeed we do care. We are rooted in this tradition called church and while each age lives out the burning issues of their time hopefully in fresh and fruitful ways, we do so rooted in the knowledge of God’s faithfulness to His people over time. Disciples of Jesus don’t go it alone, so we care about the past, and others who have walked this journey before. For a simple but compelling book on church history for adults, why not try ABC author Steve Nichols one for grown ups called Pages From Church History: A Guided Tour of Christian Classics? (Aside: you will recall how we raved a week or so ago about Diana Butler Bass’ People’s History of Church History, which is more about how ordinary folks lived out faith in various eras of the past. Steve’s emphasis on important books and ideas that shaped the theology of the practices Diana writes about is very helpful and is a good supplement to her approach.) Steve is a good, clear writer and we are happy to suggest books that are relatively easy to read and yet solid and mature. Kudos to Dr. Nichols for this good ability and gift to us all. And yet, I come back to this question of how the Christian books we sell, the ideas and convictions we talk about, the rhetoric, the practices, the lingo, are often off-putting to those outside of the church or Christian community. This, naturally, cannot finally change—that is what conversion is, after all, being transformed and transported into a new community—but we should attend to it, thinking about how our ways of doing church may or may not be hospitable and helpful to those wanting to check us out. Generation Really Thinks About Christianity…and Why it Matters by Dave Kinnamon and Gabe Lyon (Baker; $18.99) which is research done on what young adults think about religion and Christianity, particularly. 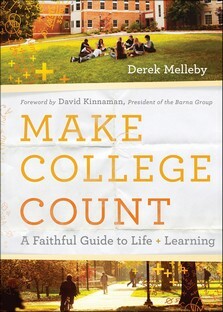 The book, and the DVD curriculum that was done later around it is very, very much worth reading. If anyone cares about what that generation thinks or how evangelical faith is perceived, it is a must. Happily, it also has tons of great stories that show that the perceptions aren’t fully fair: there are plenty of devout Christian folks that are doing remarkable work in the world—the stereotypes just aren’t accurate! This book can help us work on how we present the faith to younger outsiders. After the huge buzz on that vital book, a group of folks who tend to specialize in thinking about outreach, evangelism, reaching out to seekers and forming friendship with those outside of traditional faith communities got to thinking. What would happen if they set up shop in a given city and invited young non-churched folks to come and share, filming the events? The three who pioneered this project are Jim Henderson, who has written some very good books on evangelism (including the clever Jim and Casper Go To Church where he takes the agnostic Casper to a bunch of churches to get his feedback), Todd Hunter, whose recent Christianity Beyond Belief tells of new ways to live out a Kingdom vision in a postmodern culture, and Craig Spinks, a production geek with a heart for meaty conversations and using new media to spark discussion about the faith journey. The narrative of this effort, the road trips to several cities, the report on what happened, is told in lively and helpful chapters in The Outsider Interviews (Baker; $24.99.) I really, really liked it. Yet, as the story unfolds, it becomes evident that the enclosed DVD of the actual interviews is equally central to the experience (perhaps more so.) In fact, they call this a DVB—a blend between a book and DVD—to try to show the integrated nature of this whole project. Reading and viewing can be done in any order and they invite you to go back and forth. Both, though, are vital. As these three leaders traveled and took the time to listen to the candid stories of these young adults, the film and book increasingly became intertwined. You can read the book. You can watch the interviews. Hopefully you’ll do both. The DVD is slipped into the book, although you can buy it separately for $19.99, skipping the book. If you care about these folks that are missing from your congregational life, if you want the new generation to embrace Christ and His church, if you wonder how to help those young adults or college age students that are in your church, this could be an excellent resource. Of, if your congregation isn’t interested, maybe you might start your own study group. The whole notion of “insiders” and “outsiders” is an important bit of the dialogue. 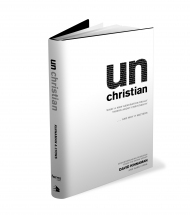 Kinnaman tells us in a good forward just what he used those words in UnChristian. That is bit of the first chapter, too, the “backstory” that Jim Henderson tells. His organization, Off the Map, is designed to help Christians see themselves through the eyes of outsiders. Interesting, eh? Here is a “trailer” for the book. Take a look. Teaching strong doctrine and church history and experiencing rich liturgy and deep community will continue to be important; caring about what outsiders think doesn’t mean we are at liberty to change the truths of the gospel. However, it is unforgivable to not care about our neighbors, including what they think. We are called to give witness, to serve others, to be God’s ambassadors. This book is an indespensible guide to doing that in our time.